When you notice anything new with your betta, it’s hard not to worry. However, don’t panic too much just yet. In this article you’re going to learn how to diagnose velvet, how to treat it, and how to prevent it. And also relax a little, velvet in bettas is treatable when caught early enough. And if you implement what you learn in this article, you’re going to give your betta a fighting chance! 2 What Are The Symptoms Of Velvet In Bettas? 6 How Long Will It Take To Treat Velvet? 7 What Causes Velvet In Bettas? 10 How Contagious Is Velvet? Velvet is a disease caused by parasites in your tanks water. It has many different names such as Rust, Gold Dust Disease, Oödinium, Coral Disease and of course velvet. If you hear someone mention any of these diseases, they are talking about the same one. The reason it gets these names is that one of the main symptoms makes your fish look like it’s covered in gold dust or rust. 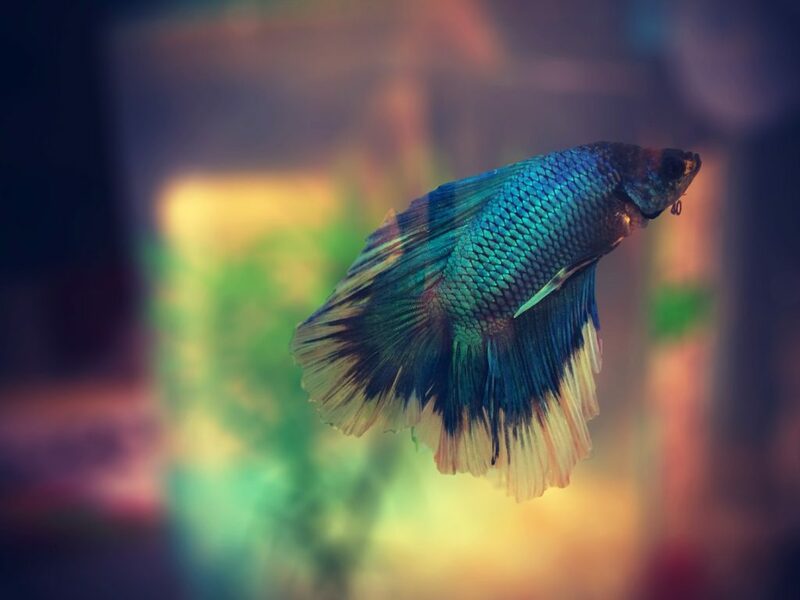 Your betta will get his majestic color dulled by gold like coating over his body. However, there is more than one symptom associated with velvet. What Are The Symptoms Of Velvet In Bettas? In the early stages, you may not notice a gold coating over your betta. The gold coating occurs due to your fish producing excess mucus, to try and fight the infection. One of the earliest signs you’ll begin to notice is that your betta will behave differently. They often begin rubbing their bodies against anything in the tank as well as twitching. This is because the parasite is irritating them. If they’re rubbing their body against things it’s because they’re trying to get the parasite off. However, this symptom isn’t just isolated to velvet. And the “gold rust” also occurs in the earlier stages of velvet, after the above symptom. Remember, it’s not the disease itself that’s making your fish look like it’s covered in gold dust. But rather your fishes reaction to the disease. Lethargy and loss of appetite are also another sign. As your fish becomes sicker they will become weak. Being weak will cause them to become lethargic and lose their appetite. If you catch your betta in the early stages of velvet then the chances are he’s going to be fine. However, watch out for the later stages of velvet. Once velvet gets this far, it can be a lot harder to treat. Eyes cloud over – This can often happen when there’s a lot of bacteria in your tank. Cloudy eyes can also be caused by a lot of other things. But if you notice this symptom and none of the others then it may be cloudy eye. Your betta will keep his fins close to his body – Once again this may not be caused specifically by velvet, because it’s often an indicator of many diseases. However, when you notice it along with some of the other symptoms listed then you should definitely start treating your betta for velvet. Your bettas eyes may begin to protrude out as well. This happens when fluid starts leaking into an area behind the eye, forcing the eye to pop out. However, this shouldn’t be mistaken for Popeye which is another disease. 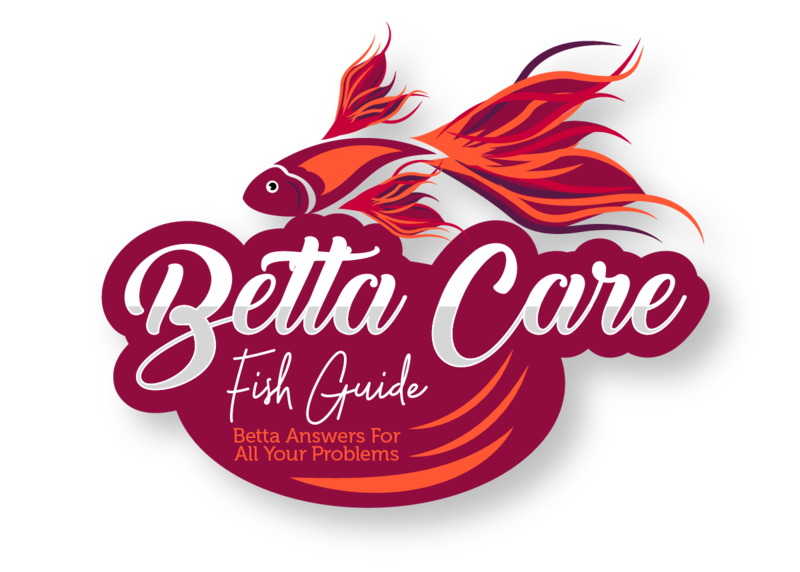 Now that you’re aware of the symptoms you should have a good idea about whether your betta is suffering from velvet. If you think that it’s velvet then follow the steps below. Luckily, velvet is curable and if you follow the guidelines below your betta has a good chance of surviving. The first step is to raise the temperature. The parasite that causes velvet will die in hotter temperatures, so whilst you’re treating your betta increase the temperature to between 82-85°F. Make sure you don’t raise the temperature too quickly, or you risk killing your betta through shock. Instead, slowly raise the temperature by 1°F every 24 hours. Simultaneously, you should also dim your tank the whole time you’re treating your betta. The parasite that causes velvet also has chlorophyll in its cells, so it can use photosynthesis. And the last step is to add aquarium salt to your tank. Once again add salt slowly. Take some water out of your tank and dissolve the salt in it, before adding it back in. You should add 1 teaspoon of salt for every gallon of water in your fish tank. You should add the salt over a 3-4 hour period so you don’t shock your fish. In more severe cases of velvet, or times when treatment isn’t working, you’ll need to use stronger medication. The main two are copper and malachite green. If you plan on using these methods, regardless of whether there are other fish or plants in the tank or not, you should use a quarantine tank. For best results, you should follow the instructions that come with the medicine. However, there are a few things you should remember. You can choose between using copper sulfate or chelated copper. Copper sulfate is more effective, however, it can be hard to keep the right level of copper sulfate in the tank as it dissipates quickly. Chelated copper, on the other hand, is a lot more stable, but some people think it isn’t as effective. Personally, I would use copper sulfate, however, if you’re not comfortable with the higher risk then stick to chelated copper. It’s also important to note that you shouldn’t use copper if your aquarium’s pH is too low. We know bettas like a pH around 7 but sometimes this drops. If the pH has dropped below 6.4 then using copper is extremely dangerous. Below 6.4 copper will begin killing the bacteria that remove ammonia and nitrates from the water. You should only use copper on fish and no other living things in your tank, including plants. That’s why it’s so important to move your betta to a quarantine tank. Copper is especially deadly against invertebrates. Along with copper, you might also consider using malachite green. Once again, different manufacturer’s of malachite green will have different recommendations that you should follow. Malachite green will also stain things in your tank, so you should only use it in a quarantine tank. And remember, even if velvet seems to be clearing up, make sure you treat your fish for the recommended number of days. Because Oödinium could still be living in the water or inside your fish. How Long Will It Take To Treat Velvet? Oödinium will only last 2 days in water without finding a new host. But if it does find a new host it will live for 2 weeks. So to make sure you’ve eradicated all traces from your tank it will take 3-4 weeks on average. What Causes Velvet In Bettas? You already know that a parasite called Oödinium causes velvet. However, it’s good to know what conditions it thrives in. And as an interesting side note, did you know that Oödinium is sometimes classed as algae because it contains chlorophyll. Either way, it’s something you don’t want in your tank, and here are some common causes. New unquarantined fish – If you’ve added fish to your tank straight away without quarantining them, they may be harboring Oödinium. This is one of the reasons it’s so important to quarantine fish for 4 weeks before adding them to your main tank. New plants – Sometimes adding new plants can introduce the parasite as well. If you plan on adding new plants you should disinfect them beforehand. Old water – The older your water is the more time Oödinium has to breed and spread. Making it more likely to infect your betta. You should be changing your water regularly. Depending on the size of your tank it could be every 2-3 days or every week. And remember to use a filter as well. A drastic change in temperature – A change in temperature could not only cause a bloom of the parasite to grow but it’s also going to affect your bettas immune system. And lastly, if your betta is tired, unhappy, or stressed then they’re more likely to get velvet. Because their immune system is going to be compromised. To prevent velvet, the key is to lessen the causes as much as possible. Now that you know all the main reasons, it’s your job to keep everything in check to make sure your betta stays healthy and strong. A few things you can do are. Make sure your betta has a nutritionally complete diet. Bettas are meat eaters so make sure you’re giving them plenty of meat. Bloodworms, daphnia, mosquito larvae, and brine shrimp are all great in combination with high-quality betta pellets. Live food is even better for them, as it makes them work more for it. You should be monitoring your water. Make sure that you’re checking the pH and temperature as well as the other water parameters. If anything is out of sync then you must take the appropriate action to fix it. Avoid stressing your betta out. For example, if you notice him flaring a lot he may be able to see his own reflection. Constant flaring causes stress and can increase the chance of catching velvet. Velvet is an easy disease to treat when caught early enough and when the appropriate actions are taken. However, if left unchecked velvet can quickly become fatal. 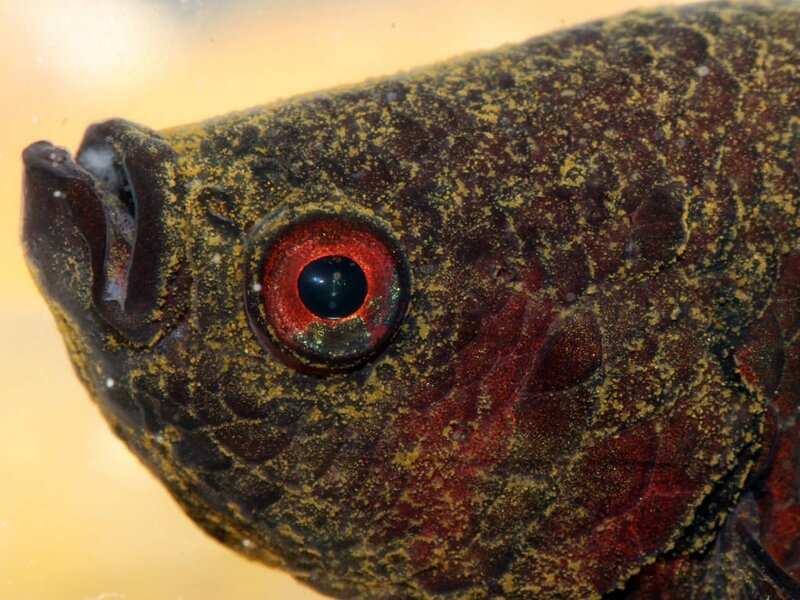 Velvet often starts in the gills of fish, where it infects the cells before eating them. If this goes on for long enough, respiratory failure will occur in your betta and he’ll die. Velvet is extremely contagious. If you have other fish in your tank you’ll need to remove your betta immediately to stop the spread. And to make matters worse, when the protozoa are looking for a new host to infect, they won’t be visible in the tank. So you won’t be aware they are there. There are four stages that Oödinium goes through in its life cycle. First of all, it feeds. This is when it first infects your fish. It will begin eating the cells it has infected as well as photosynthesizing using any light available. The second stage occurs when the parasite has matured enough. It will eat its way out of the skin and float freely in the water. Next, the parasite will begin reproducing by dividing itself. The second and third stages are the stages the parasite are most likely to die. Because they can only last a couple of days in this state without a host. Lastly, they will seek out a new host to infect. That’s everything you need to know about velvet in bettas. Here’s a quick recap to refresh your memory. Velvet is caused by parasites in the water which need light and stable temperature to survive. In the early stages of infection, you may notice your betta rubbing against things before a gold dust appears over their skin. As velvet progresses common signs to be aware of are clamped fins, bulging eyes, eyes that have clouded over, skin ulcers and skin detachment. To treat velvet you should turn off the lights in your tank, turn the heating up and add salt to the water. But make sure you do this over time and not all at once. In more severe cases you will need to use copper or malachite green to treat your betta. Treatment of velvet will take 3-4 weeks. Velvet can be caused by poor water parameters, new plants or fish being introduced to your tank, old water, stress and a drastic change in temperature. It’s also extremely contagious and if you have more than one fish, the infected one should be quarantined immediately. Velvet is easy to treat, but fatal if left unchecked. If you liked this article and you found it helpful, make sure to check out the rest of the website. And remember, any more questions can be left in the comment section, otherwise have a great day! Dropsy In Bettas – Learn everything you need to know about dropsy. If you see the main sign of dropsy (bloated stomach and pinecone scales) then it may already be too late for your betta. But there are some early signs you can watch out for! Fin Rot In Bettas – Another disease that is easily curable, but fatal if left unchecked. Find out why your betta is getting fin rot, how to treat it and how to prevent it in the future!